New members will be sorted into one of the 4 Student Interest Groups (SIGs) based on their area of passion: Doveswarm (Migrant Worker Issues), Glass Ark (Environmental Issues), Empty Pocket (Poverty) and Lifeline (Healthcare Issues). These are closely aligned with the Millennium Development Goals. Within these groups, members perform direct service with beneficiaries of their choice to gain greater awareness of their needs. Subsequently, they embark on two self-planned advocacy projects; one for each of their two semesters in CA. Alongside SIG projects, CA has been at the helm of several flagship events. Arguably, the most well-known one is Hair for Hope. 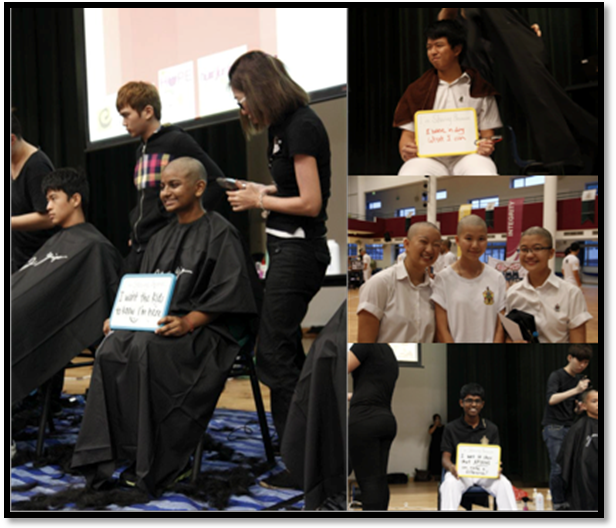 Held annually at the Yr 5-6 side, the event is organised in collaboration with the Children’s Cancer Foundation and is a satellite of a larger national movement. It aims to eradicate the association of baldness with ugliness. Currently, the CCA is preparing for their batch project: No Shoes Day 2013. On that day, Rafflesians will get to experience being barefoot. Through this, the larger student body can experience what people who cannot afford shoes have to go through, and thereafter not take the little things they have for granted. 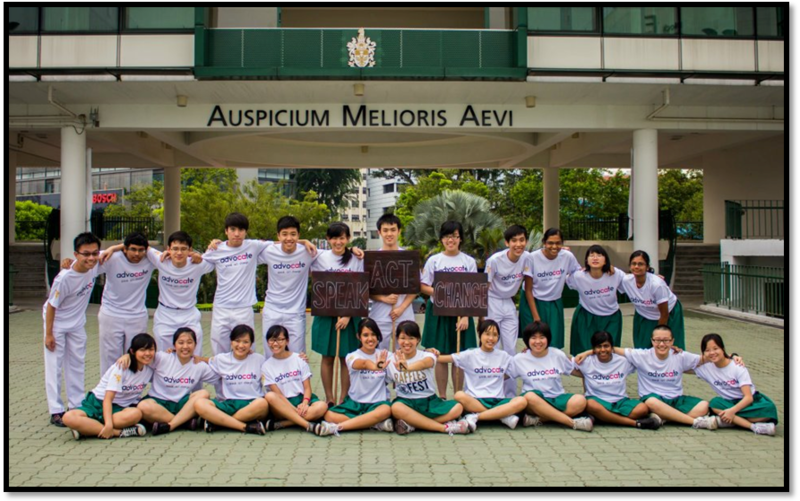 An exciting project also awaits CA in June 2013, as they will be playing host once again to the biannual Global Alliance of Leading Edge Schools, a conference bringing participants from all around the world together. Participants discuss social issues experienced by their respective countries, brainstorm possible ways to improve the aforementioned situations and hone advocacy skills. Members can – and are highly encouraged to – initiate their own projects. Projects such as 30 Hour Famine and 500ml (more details can be found on their website below) were the brainchildren of members who were keen on exploring causes outside their SIGs. Through this wide range of events, the CCA is able to continually pursue more innovative methods of advocacy, and improve as advocates for the community. Of course, General Meetings (GMs) are not all work and no play. 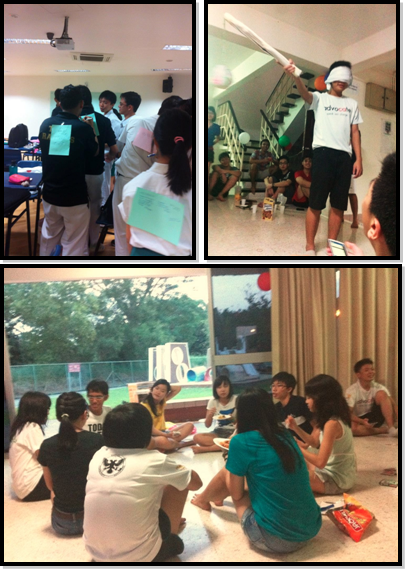 A portion of every GM is dedicated to activities encourage intra-CCA bonding amongst members. Members also go out for several outings together after CCA and over the holidays. Hence, CA is not only a place for shaping your advocacy skills – it’s also where you have the opportunity to make great friends with similar interests. Are you someone who is keenly passionate about speaking out and making a positive difference to the lives of those around you? Do you need an avenue to channel that passion into action? Join CA. General Meetings are held every Wednesday from 2-4pm.